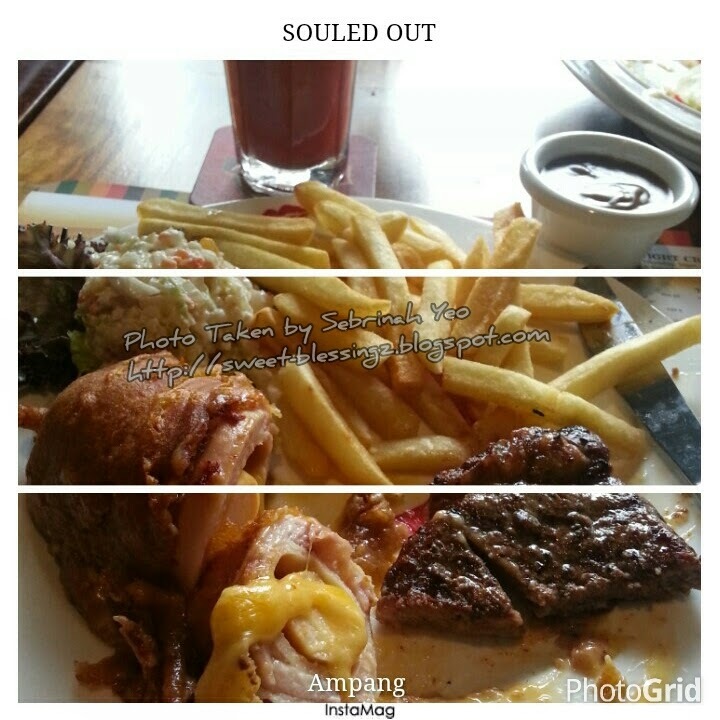 Souled Out @ Ampang, interesting name to go by. The first time I heard it years ago, I was thinking "SOLD OUT?" like seriously?? Then I saw the "actual" spelling and it was funny then. "Tomato Juice" and "Chicken Cordon Blurr"
I love the "Tomato Juice" here (with no ice pls). Rich and yummy. And ye, I ordered the "Chicken Cordon Blurr". I ate like half of it and packed the other half to-go. Was very very full because of the cheese and all stuffed together. Btw, my colleague had Sirloin Steak (Well Done), so we kinda cut up quarter of her steak nad quarter of mine and shared hehe... The sirloin steak was good and was "Well Done" but it wasn't that hard to chew on. Just perfect. Go there and try it yourselves! I know I won't be going too often because of the location is nowhere near me plus I'm gonna be away from KL city soon, so yeah... Maybe some other time, special occasions or so.